Do You Have Regular Events at Your Restaurant? When you have regular events at your restaurant, you give customers a reason to keep coming back. You give them new experiences each time, so they look forward to your next event. In addition, regular events give the press something to report on and the blog writers new content. Hosting events at your restaurant is a smart marketing move. When most people think about holding an event, whether it’s a business meeting, wedding reception or rehearsal dinner, charity benefit, or holiday and birthday parties, restaurants are usually the first place they think of. If you agree to host events at your restaurant, you’ll likely bring in customers who’ve never heard of your restaurant. Since they are coming to the event at your restaurant, you have the opportunity to knock their socks off with your great food and customer service. The person who attends your event, is treated with exceptional care and enjoys your delicious food is now a customer for life. Additionally, when you host an event for someone else, you can piggy back on their marketing efforts. Think about the charity benefit you might host at your restaurant. That charity is certainly going to market the fundraiser through their website, email, social media accounts and more. You are now part of their marketing powerhouse, and you didn’t even have to pay for it. Let’s talk about the different kinds of regular events you might have at your restaurant. If your restaurant has a bar or serves wine, you can host wine tasting events to bring in not only your loyal customers but some new faces as well. With wine tastings, you offer customers the chance to learn more about wine and sample a glass or two. Consider hosting regular wine tasting events. Base them on different regions or different vintages. How about a wine tasting party called the 10 Best California Wines or the 5 Best Wines of France. Be creative! Wine tasting events allow you to network with your guests, and that brings in repeat business. Your event should provide samples of wines. You can use a small wine glass or sampler glass so your guests can taste but not have too much. Serve a special appetizer menu, cheeses or desserts, too. You might bring in a sommelier or wine enthusiast to talk about the wines you are featuring for the event. Consider having a wine and cheese tasting or wine and dessert tasting. You’ll light up the sales of your wine and the additional food offerings. The best days for a wine tasting are usually Friday and Saturday when people are relaxed and not worried about work. Food tastings driven by chefs are increasing in popularity. Your chef can offer items not regularly found on your menu. You could feature a multitude of menus: vegetarian, ethnic, gluten-free, locally-sourced, based on a specific meat, cheese or pasta, soup-driven, centered on a specific region (think food from Northern Italy or New Orleans cuisine) and much more. The trick here is to offer something special and unique. You’ll draw in new customers and build upon the loyalty of your regulars. Music brings in the crowds. Local musicians are always looking for a place to play. How about dedicating one night a week to jazz, world music, reggae, classical – you name it. Make sure to advertise it all week long – use your social media venues and email marketing. It will take a few weeks, but soon people will line up at the door to eat your great food and listen to fine local music. Hosting a charity event is a win-win for restaurants. Hosting a fundraiser is a great way to get involved with the community. You provide the space for the fundraiser while helping raise money for the charity and making some money for your restaurant, too. If you have the space and appropriate venue, you can host fancy, banquet-type affairs. You can also offer your restaurant as the final stop in charity walks/marathons. On your own, you could advertise 10% off your customers’ meals when they bring in a specified item for donation. This is great done at Thanksgiving and Christmas. But, we suggest you do this at other times during the year, too, as the need is always there. Host private parties at your restaurant. These could be wedding events, birthday parties, bridal and baby showers, family reunions, business meetings and more. You can designate a private area for parties in your restaurant, or if space is an issue, you can rent the entire place. These types of parties require little planning on your part, and they make for terrific sales. When you hold events on your own (in other words, an outside group isn’t coming in and asking you to host), you increase your marketing reach. First, it lets people know you can handle events so they’ll remember you when they need an event. Second, it brings in repeat and new business on a regular basis. Bring in a guest chef for the night and sell tickets to the event. Make it a private, exclusive event. Have a regular weekly or monthly cooking class on a Saturday afternoon. Host a local farmer, bakery or co-op. Bring them in and let them work with your chef. They will in turn bring in some of their clientele so you’ll get in front of more people. Have a parent/child cooking class. Have a private, reservations-only introduction of your new menu items. Once you’ve decided to host regular events at your restaurant, it’s important to publicize them. This is for the events that you are planning. Promote the event with posters and flyers in your restaurant. Put it on your website. Send out a dedicated email to announce the event. Publicize your event on your social media channels. If, for example, you are hosting a wine tasting, start sharing photos and videos of wine across all social outlets. Write blog articles about wine. Think about selling tickets and taking reservations. This helps you know how many people to expect. 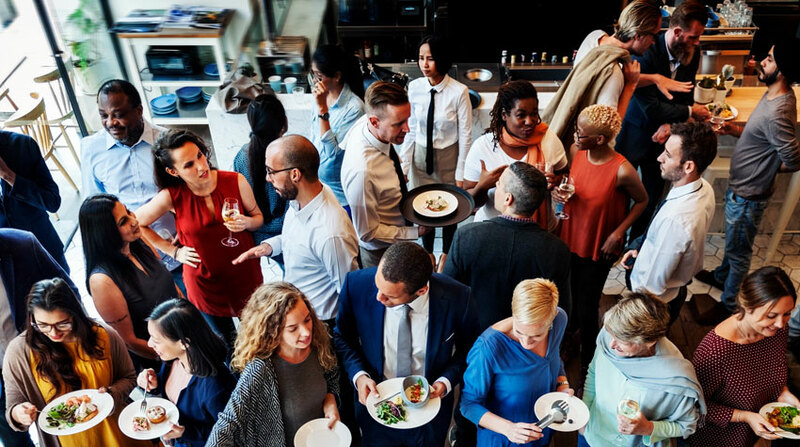 If you want to advertise that your restaurant is the hot-spot for other people to host events, you can use the same channels to promote this as well. Consider a brochure explaining what you’ll provide. Put this on your website and link to it often from your other digital media. Remember, hosting regular events at your restaurant increases your exposure and helps fill more tables during regular dining hours. Next post LinkDo You Have the Passion it Takes to be Successful?